Policy Press previously published a Social Atlas of Europe, with the same author team in 2014, which explored European identify through a range of different facets. 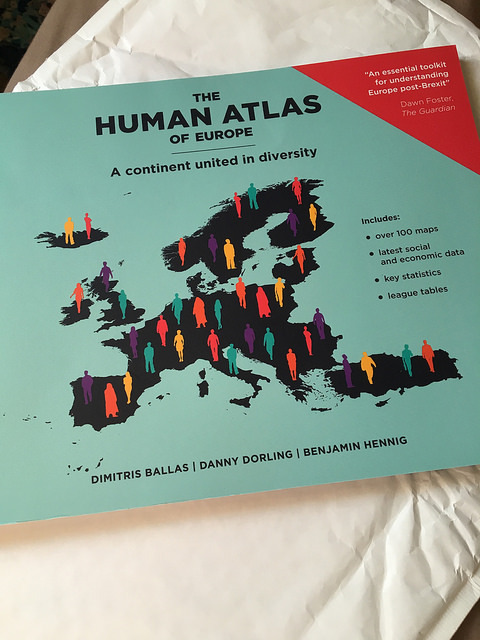 This Atlas explores provides a human perspective on Europe as it exists today, and explores how it might look in the future. The motto of the EU is “United in Diversity”, and the authors explore the strength that this diversity offers, viewing ‘Europe’ as a single large area stretching from Iceland to Turkey. A reference map at the start identifies the 43 countries that are included in the maps, and their part in the evolution of the European Union. Ben Hennig’s innovative and bold cartograms and other diagrams will be familiar to many, since their first use in Worldmapper. They also formed part of the more recent LondonMapper project. For those who haven’t seen Ben’s gridded-population cartograms, their construction is explained. The presentation of the mapping is crisp, and the consistent layout of the pages and colour ramps that are used allow for easy comparison between indicators across the atlas as a whole. The atlas is split into a number of sections, each with mapping based around a theme. These are Population, Wealth and Poverty, Health, Education, Work, Environment, Politics, Identity and Culture and EU budget. Each theme also allows for an exploration of demographic issues such as an ageing population, the pensions ‘timebomb’ and changing voting patterns. The data used to construct the maps are drawn from a range of authoritative sources, all clearly identified in the appendix. We learn many things from them: the huge number of asylum seekers hosted by Germany, the draw of Spain for people born abroad, the fact that Turkey and the UK have a third of Europe’s prison population between them, and the variations in dental treatment across Europe. The maps are accompanied by pie and bar charts, which bring some of the data patterns into sharper focus. Full-page maps are accompanied by a ‘top five’ and ‘bottom five’ for the relevant social indicators, showing regions which lie at the extremes of each data set. These assist in further analysis of specific trends. Each map also have a written commentary, which suggest further areas for investigation. The maps pose many interesting questions for further enquiry: why does Monaco have twice as many telephone lines as any other country? why do so many Portuguese have no schooling? why are the Dutch the ‘happiest’ in Europe? why do the Macedonians value their friends the most? The authors are adept at bringing out the geographical stories underpinning the maps. The inclusion of a Eurovision Song contest map for the 2015 contest is an illustration of the flexibility of Ben Hennig’s cartograms for exploring and visualising contemporary social data. “Where else but in Europe do so many have so much without realising what they have? Europe is a continent that is truly united in such diversity”. This would make an excellent purchase for those grappling with some of the themes in new specifications, or who want a fresh perspective on familiar issues such as population and health.